The Northern Lights – Up North! It’s not often that a day goes by without finding a JAMMER lost in a travel mag – we do have clients in the sector, so it’s all in the name of research of course! Research aside, we all have a genuine love of travel and a trip to see the Northern Lights was high on our bucket list! 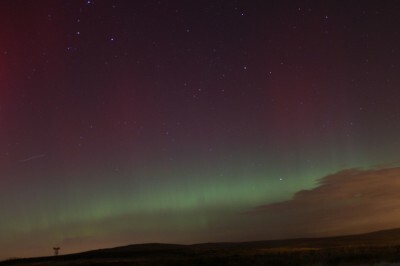 We were all therefore very excited to hear that the Aurora Borealis made its appearance in Manchester last night! Whilst dreams of watching the light show sipping champagne from a hot tub in Iceland still appeal, we are all equally as keen to see the natural phenomenon in all its glory set against the backdrop of our favourite city. The images taken last night from across Manchester, that have been published on the Manchester Evening News, show Manchester’s stunning skyline in a completely different light and with the chance of a second sighting tonight, we’ll settle for our hoodies and a hot chocolate! After all, it’s not every day we get the opportunity to experience something like this on our home turf – it is about 10 years since the Northern Lights were last seen in above our skies. It’s been a crazy busy week here at JAM Towers, with the launch of client campaigns, hard hitting news stories being developed, welcoming a new member of the team and hitting the phones to secure coverage. However, through the whirlwind of press releases, new business and media logs, the team have still been keeping abreast of the recent news headlines; keeping up-to-date with regular updates from Sochi Winter Olympics Sochi Winter Olympics, the devastating floods and of course Scotland’s wish to leave the UK. One story in particular caught the team’s eyes this week, so much so that Wednesday is now being dubbed ‘the day that news stood still’. To the team’s horror, it was reported this week that TOWIE starlet, Lauren Goodyear, narrowly missed a harrowing encounter with a… puddle (yes reader, you read correctly). Now obviously being a glamorous team that’s based in Manchester, we’re well versed in the deep dread of horror that an unplanned burst of rain can bring to a well-planned outfit (it happens a lot up North), but national news? Possibly one of the most frustrating, and often unavoidable, parts of our job is client coverage being bumped for more newsworthy pieces – newspapers are after all… about news. However, PR’s across the globe still pray for one of those all elusive ‘slow news days’ come client campaign launches, and not because what we do as an industry is frivolous, by no means at all. But after hours of planning, developing and implementing you want to do everything in your power to have a campaign succeed and do a great job for the client. So… the secret to finding the PR Holy Grail? It’s all in the turn of a heel… especially where Lauren Goodyear is concerned! We’re excited to have been enlisted by another fantastic client this week – Manchester’s very own The Printworks! Yes, the JAMpr team will be supporting the iconic entertainment complex with all its PR activity over the next 12 months, raising the profile of the venue and its 20 tenants, which include Hard Rock Cafe, Prezzo, Bierkeller, Virgin Active gym and Odeon cinema, as well as other popular dining and socialising outlets. To kick off, we’re supporting The Printworks with its exciting Design A New Mascot competition this month, so we’ll be looking for budding artists in the region to submit creative designs. The winning entry will win a once in a lifetime prize by having their mascot brought to life by Hollywood special effects make up artist and sculptor, Shaune Harrison, who created make up for Voldemort from Harry Potter, Red Skull from Captain America, as well as many other well known movie characters. We have already secured some great pieces of coverage for the competition including with our blogger friend Mouth O’Mighty, and on local news websites Manchester Gossip, Mancunian Matters and Manchester Gazette, with plenty more to come. Why not get the kids to design a new mascot during the half term holidays, or have a go yourself if you love doodling superheroes and characters. Entries don’t need to be professional and can just be a hand drawn sketch. Have a look at the website for more information and for details on how to enter. Just click here. There are lots more exciting events and activities in store at The Printworks and we can’t wait to get involved! From The Printworks Unsigned band contest (Jaime Gee on lead vocals?) to a Vintage Swing Festival in April (any excuse to dress up and have a boogie! ), there’s something for everyone to enjoy so watch this space for updates. The past, they say, is another country – they do things differently there. And the celebrations to mark Facebook’s 10th birthday this week are a sign of how much the way we communicate has changed in the last decade. was still predominantly being used by unsigned musicians and poorly laid out online chat rooms were where people went to talk online with like-minded friends. Facebook, with its photos and status updates has given people – and brands – a forum to reveal and share more information about themselves than we could have ever imagined. Or in some cases #TMI. Designed as a way for students to keep in touch with what their friends were up to, it’s now one of the first places some of us turn to to announce a major event in our lives – be it an engagement, a birth or a break up. And increasingly, it’s become a way to keep in touch with friends and family we don’t see all that often, allowing us an insight into the world of those we care about with much more immediacy than letters or phone calls. Facebook has not only changed the way we connect with people, it’s changed the way we connect with brands. Businesses of all sizes are now able to engage with huge audiences worldwide to promote their products and services – and many have reaped the results. experienced increased sales and return on investment after moving its spend from traditional TV advertising to Facebook (source: Facebook for Business Success Stories). In a world that’s ever more crowded with demands on our time, Facebook has succeeded because it enables us to engage with the world in an easy, effective way, allowing us to tell stories concisely and creatively. And to mark its 10th birthday, Facebook is allowing its users to tell their own story of the last decade in video form. Of course, here at JAM, we couldn’t resist joining in. We hope you ‘LIKE’ it. See JAM’s last 10 years here!